The adventure continues. It is a cold December here in Xela in the mountains of Guatemala; central heating is a luxury we don’t have! Still, it is nice. The last couple of months have been unbelievable, so many highs from a collection of great experiences. I did a lot more travelling, I went to Mexico again, a country that never disappoints, I took a trip to El Salvador for the first time and I also spent another great weekend in beautiful Lago Atitlan. The weekend in Lago, organised by some Alterna friends leaving Xela who wanted ‘one last weekend together with the people that meant the most to them’, was just one of those special moments to be a part of it. We spent the Friday night, the group of 10 or so of us, sitting on the deck of our house by the lake, one of the lads on guitar, another on harmonica and just having the craic singing. That night can never be repeated, I just hope that I have more of them. Then on the Saturday night over a quality dinner cooked by my Italian friend, everyone shared something about the people leaving Xela and what they meant to them and the people leaving spoke. Strong friendships were forged during the time shared in Xela and it was a nice experience to witness such an open display of affection and gratitude for memories shared. Maybe it is an Irish thing or maybe it is just my experience but it is not often we tell people close to us just how much care we about them and remind them why. It usually takes a life changing event – an illness, a relationship ending etc. – to prompt such openness. I guess that’s what travel does, it changes you slowly; maybe I’ll be more open going forward. On the work front, one of the highlights was the week I spent in Antigua working at Alterna’s impact investment conference. 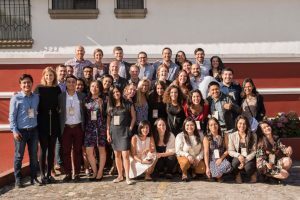 The conference, which is now in its third year, brought together over 450 impact investors and entrepreneurs from Latin America and the Caribbean, a great achievement for the small team primarily responsible for organising the event. It was a nice experience to be part of it and it was impossible not to feel inspired, particularly by some of the social entrepreneurs. While I spent quite a bit of time outside Xela over the last two months there were also some standout moments here too. For Thanksgiving there were about 15-20 of us for dinner and the lads that hosted are serious about their cooking, the turkey and ribs slow were slow-cooked all day! Another epic night was “Noche de Irlanda” (Irish night), a monthly tradition where different nationalities within Alterna host a night. I hosted the night with my two Irish American friends and it is fair to say we put Ireland on the map! I think more than most nationalities, perhaps it is because of our history of emigration, we see ourselves as ambassadors abroad. That sentiment might be changing as we have become a wealthier country but when I am abroad I always promote what is great about Ireland and encourage people to visit. At the same time, when I am travelling I am reminded just how small Ireland is and it is hard not to feel discouraged by how incapable the political elite seem to be to build a more inclusive society. For me, the Irish mindset that I relate to is of the adventurer, the Celtic spirit and that fight for what they believe is right irrespective of the barriers put in front of them. I don’t see that in our leaders. While you might not like Conor McGregor’s brash style and certainly his antics recently don’t reflect well on him, I think his commitment and determination in his sport embodies the Irish Celtic spirit. One of his many quotes that inspired his Irish fan base was the line “if one of us goes to war, we all go to war”. It is the type of spirit that has inspired many of our memorable sporting achievements as a country. If the political establishment collectively brought that type of spirit to running the country they might inspire everyone to work together to solve some of our social problems, the most pressing being the homelessness crisis. We are a tribe of less than 5 million people; individually we should embrace the mentality: ‘when one of us suffers, we all suffer’. We should not accept any level of homelessness. 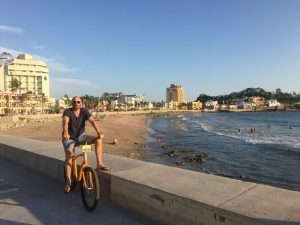 In October I spent 10 days in Mazatlán, a Mexican beach town, a city really, along the Pacific coast in the state of Sinaloa, referred to as the “Pearl of the Pacific”. 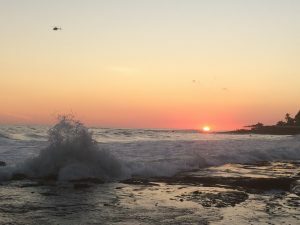 If I was asked to describe Mazatlán in one word it would have to be “sunsets”. They are epic, something new every evening and with 20km or more of beach front there are no shortage of spots to enjoy them. The Mexicans love their food and being one of the largest fishing ports in Mexico some of the best seafood dishes are on offer; the ceviche I had was unreal. The city is not the likes of Cancun, overrun with tourists and its resorts offering a taste of Mexico within the confines of a gated community. 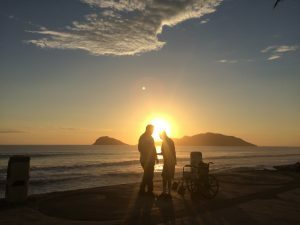 Tourism is a big part of the economy in Mazatlán and is a popular retirement destination for North Americans but it does not seem to have diluted the Mexican authenticity of the city. However, investors are starting to see an opportunity and a real estate boom is in the making. I spoke with a few people involved in property development and as you might expect, they are extremely bullish on the outlook for Mazatlán and property prices. They seem to have a strong case given what the city has to offer, the money being invested by the government to develop the city and the fact that prices appear relatively attractive, with foreign investors also benefiting from the depreciation in the Mexican peso. 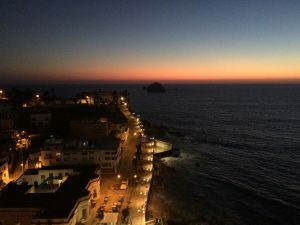 A city with warm weather, nice beaches, amazing food and top class Mexican hospitality, Mazatlán is well worth a visit. In fact, I liked it so much I am flying back for Christmas and the New Year! El Salvador was much different to what I expected, given its notoriety for its high murder statistics. Immediately crossing the border I noticed the roads seemed much better than Guatemala, a sign perhaps they are investing more in the infrastructure of the country. Some of the roads in Guatemala are ridiculous with huge potholes, which you’ve to avoid with the roadside edge of a cliff taunting you! 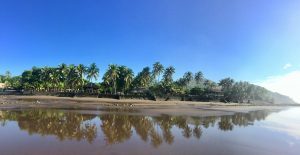 I went with a group of friends from Alterna and we rented a beach house in an undeveloped surf spot called El Zonte, about 15 minutes outside the more populated surf town of El Tunco. There was no Wi-Fi in El Zonte, a major positive for getting away from the noise. 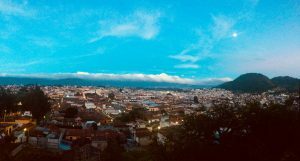 We also went on a day trip to Costa Del Sol via the infamous city of San Salvador, with a couple of El Salvadorian guys, who some of our group met hitchhiking from El Tunco to El Zonte (hitchhiking is more common in Central America). It was a random meeting but we had a great day with them seeing more of El Salvador. Clearly, starting the day with a pool party at their parent’s beach house it was obvious we were hanging out with the wealthy of El Salvador. It was a glimpse into the wealth inequality in the country and it was interesting to get their insights on this too. Old money dominates and an estimated 20-25% of their population has been forced to emigrate and work illegally in the United States. At this stage, I think I could dedicate a blog solely to impact investing, a field that is still in its relative infancy. Some of the vagueness around the impact investment sector can be frustrating but it also provides plenty of scope for exploring and challenging what the sector really stands for. As I see it, how you define your investment philosophy and objectives when you incorporate the idea of social impact can vary dramatically depending on whether you see the role of impact investors through the eyes of the dreamer or the eyes of the pragmatist. The dreamers are those that believe social change is possible through business and that impact investors should primarily be focused on allocating capital to maximise impact, financial return should be a secondary consideration. However, the pragmatist smiles wryly at such idealistic notions and is anchored more to the “real world” business model that defines our current system. Rather than being core to everything a business does, the pragmatist sees impact objectives as an add-on to the fundamental objective of making money. While the dreamer seeks companies that are focused on delivering impact right now the pragmatist is more willing to accept baby steps in terms of companies reaching their impact objectives. There is a balance to be found between these two views if impact investing is to become part of the mainstream. Why worry about the mainstream? The benefit of becoming part of the mainstream would be that even a small allocation within investment portfolios would exponentially increase the capital allocated to the sector and hence the impact being delivered across the globe. It might also force traditional investors to think more actively about the actions of the companies they are investing in and prompt companies to adopt a more stakeholder friendly business model. Still, the risk is that a move into the mainstream could mean handing over the direction of this budding sector to the sharks of the financial system. Therefore, I think we need the dreamers in the sector to ensure that impact investing doesn’t lose the essence of what it is supposed to stand for, “social impact”. At the impact investment conference in Antigua I got to see the types of investors searching for investment opportunities and I am not convinced social impact is that high on their agenda. At the same time, we need the pragmatists to ensure that we don’t lose sight of the fact that there still needs to be a viable business. To deliver long term sustainable impact a business must be able to sustain itself, i.e. it must be able to make profits. That way a company can grow organically or attract more investment if needed and hence deliver a larger impact over time. Otherwise, you are merely talking about a different form of charity. I think it is fair to say that learning Spanish has been one of the biggest challenges I have taken on. It is very different to any other type of learning I have done and that is coming from someone who has studied intensely for many an exam over the years. I remember when I moved to San Diego I studied every day for 3 months for the Series 7, the stockbroking exam. Then there were the CFA exams, I studied 500-600 hours for the Level 3 exam just to be 100% confident I’d pass it and avoid having to re-sit the exam the following year. I feel like the concepts in investments, economics, finance etc., you either get them or you don’t. The hours are just needed to cover all the material and be sure you pass an exam format. Lago Atitlán, the epic view from our lake house. However, learning Spanish is so much different. Language is more fluid and while you may understand the parts – ‘verbs, adverbs, adjectives, nouns’ – it is the sum of the parts that matters. The great poets or writers are the ones who have the ability to massage and weave words together in a way that conveys something greater. The longer I am here I am realising that learning a new language has two elements, learning the parts to be able to converse but then being able to manipulate the parts to communicate more freely and in a deeper way. I can converse but I am still a long way from where I want to be in terms of manipulating the language and from reaching the depths of expression that Spanish has to offer. Still, I have two big things in my favour to reach that point, time and a commitment to continue learning. One of the things I have just started doing, on recommendation from a friend is to start writing in Spanish. Originally, the idea was to write about my day but that bores me in English, never mind in Spanish. So I have moved on to writing on various things; I find it very useful, learning new words, some of nuances with sentence construction and of course getting the corrections. My plan is to keep it going and maybe write 2-3 entries per week. I have included below my entry from November 23rd. Google translate might be needed. Otro día, otra oportunidad para hacer lo mejor. Me gustan las mañanas aquí en Xela, tomar mi café en mi terraza con el sol brillando y las mariposas jugando tontamente, la naturaleza en su mejor momento. Tuve otra buena clase de español con mi nueva maestra esta mañana. He aprendido que un cambio es una buena cosa cuando tú estés aprendiendo español, aunque es solo un cambio de voz. También, me siento más cómodo aprendiendo aquí en mi casa en lugar de un café que era el caso antes. A veces no apreciamos la habilidad necesaria para ser un buen maestro. Hay muchos maestros en cada campo, pero los mejores son los que tienes pasión para lo que hacen; es más fácil para estos maestros motivar sus estudiantes. Además es importante poder explicar cosas de una manera simple, tener paciencia, mantener entusiasmo y tener estructura con cada lección. Por supuesto, necesitas ser también flexible con tus estudiantes, porque cada persona es diferente y no hay solo una manera de aprender. En mi mente, una gran parte de mi trabajo como un consultor ha sido enseñar, ya sea con clientes o colegas. Como líder es importante desarrollar a las personas que están a tu cargo. Creo que como un líder puedes dar órdenes a gente o puedes enseñarles y entonces les den la libertad para trabajar. De esta manera tú puedes aprender también. Hay una opción con clientes también. Normalmente con clientes hay una brecha de conocimiento, pues esta es la razón por la que contratan a un consultor. Sin embargo, al mismo tiempo, los consultores se benefician de la brecha de conocimiento. Por eso hay dos tipos de consejos de consultoría, un tipo con el cliente en la oscuridad donde decimos cómo hacerlo y otro tipo de consejo donde enseñamos a los clientes cómo hacerlo. Para mí, yo prefiero el último; quiero que mis clientes tengan el conocimiento para tomar decisiones o por lo menos que comprendan el porqué detrás de la decisión. En mi opinión, hay solo una opción. Mi Xela! My terrace view that I’ll never forget. Well, that moment has arrived. I feel like the time is right to make a change and pursue the next part of my adventure. 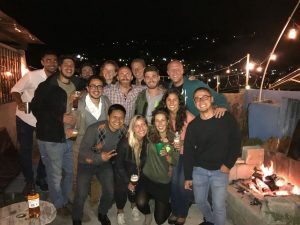 Xela has been great for me, I have made a lot of genuine friends (not just acquaintances), I have learned a lot of Spanish, I’ve delved into the impact investment sector, and above all I have experienced living in Guatemala, a very different country from Ireland. But I have more to do and see. So I have a little over two weeks left in Xela. 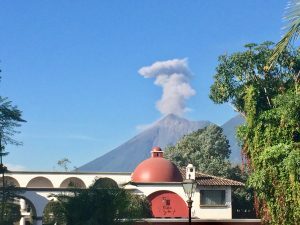 The intention is to finish my Spanish lessons on a strong note, close out some projects with Alterna, win my last two games with my football team, potentially climb Tajumulco volcano (the highest peak in Central America) and say my goodbyes to friends and to a city that has left its mark on me. What is the plan? In keeping with the general theme of my adventure my plan remains loose. I fly to Mazatlán, Mexico on December 19th for Christmas and the New Year and I’ll base myself there in January and try to see more of the country. I have an apartment organized a couple of blocks from the beach. I’ll take the time to think about the next leg of my adventure and possible consulting opportunities available to me. When I was in El Salvador, one morning while running on the beach with a friend I saw a person almost drown. He got caught in a current and tried to fight against it. I could see it happening but there was nothing I could do, I am terrible swimmer. 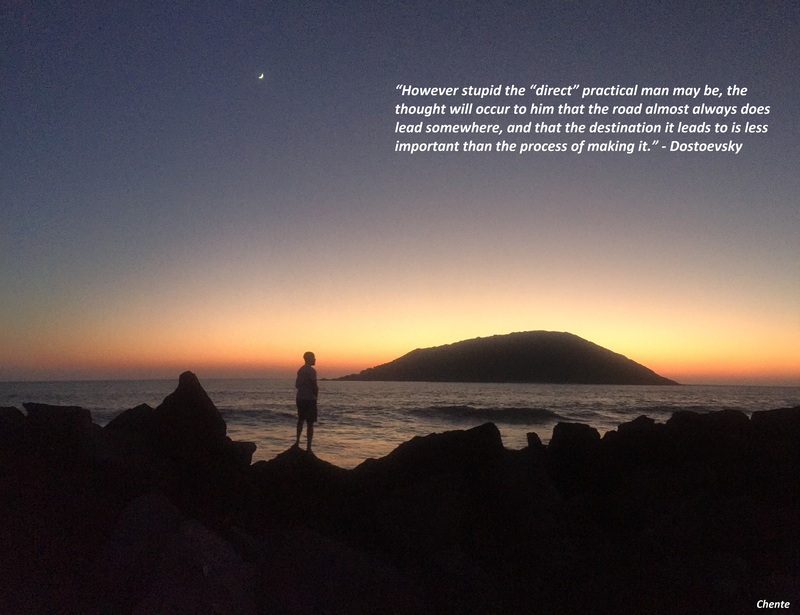 There were a couple of guys waving frantically from the shore for him to swim their direction but it was of little use. I genuinely thought he was a goner. Eventually, he got so tired he gave up and the current brought him out of the rip and the guys from the shore, who had jumped in to save him, pulled him out of the water on to the beach. We went over to see if was he okay and he was holding his head breathing heavily, unable to talk. He was in bad shape but he’d live to fight another day. The shock on his friend’s face said it all; he knew how close his friend has come to meeting his end. The worst part was that slow motion feeling, where you can see it happening but you are helpless to do anything. It did get me thinking though, about how close the margins can be sometimes between life and death, how we need to remind ourselves to appreciate each moment because things can change in an instance and of course the respect we need to have for nature. I can’t swim very well but I do remember the number one rule if you ever get caught in a current, do not fight against it! You have to go with the flow, fighting will only tire you out and fatigue is one of the main causes of drowning. I think it’s the same in life; it is always better to go with the flow! It’s time for the next part of my adventure! P.S. Thanks to everyone who contributed to the dog fund I set up. The money raised has been put to good use and I will be posting a separate update on the Justcaring page.